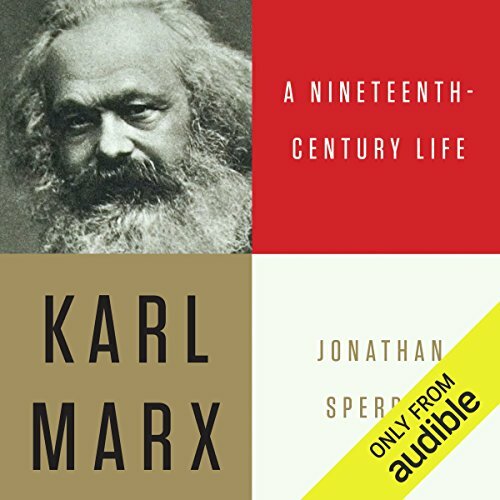 Karl Marx: A Nineteenth-Century Life by Audible Studios at Spring Brook Audio. Hurry! Limited time offer. Offer valid only while supplies last. Karl Marx is a magisterial and defining biography that vividly explores not only the man himself but also the revolutionary times in which he lived. Karl Marx is a magisterial and defining biography that vividly explores not only the man himself but also the revolutionary times in which he lived. Between his birth in 1818 and his death 65 years later, Karl Marx became one of Western civilization's most influential political philosophers. Two centuries on, he is still revered as a prophet of the modern world, yet he is also blamed for the darkest atrocities of modern times. But no matter in what light he is cast, the short, but broad-shouldered, bearded Marx remains - as a human being - distorted on a Procrustean bed of political "isms", perceived through the partially distorting lens of his chief disciple, Friedrich Engels, or understood as a figure of 20th-century totalitarian Marxist regimes. With unlimited access to the MEGA (the Marx-Engels Gesamtausgabe, the total edition of Marx's and Engels' writings), only recently available, Sperber juxtaposes the private man, the public agitator, and the philosopher-economist. With Napoleon III, Bismarck, Adam Smith, and Charles Darwin, among others, as supporting players, Karl Marx becomes not just a biography of a man but a vibrant portrait of an infinitely complex time. Already hailed by Publishers Weekly as "a major work... likely to be the standard biography of Marx for many years," Karl Marx promises to become the defining portrait of a towering historical figure.